Xbox Live Arcade is credited with popularising the notion of downloading console video games. Other consoles, like the Genesis, offered them a lot earlier, albeit with limited success. The CVC GameLine did things even earlier. We're talking 1983 earlier. And while it all ended in disaster, the ashes of the venture would bizarrely lead to the creation of one of the internet era's biggest companies. Despite sounding like something out of a science-fiction movie (at the time), in 1983 the technology already existed to send video games over a phone line and into the home. The phone line speeds were slow, of course, but the games were small, making that a moot point! Seeing an opportunity to make some money (and to make use of an infrastructure built as part of a failed deal with music labels), a man by the name of William von Meister founded a company called Control Video Corporation, who sold an Atari cartridge that, when plugged into both an Atari 2600/VCS and a phone line, could download games over the internet. 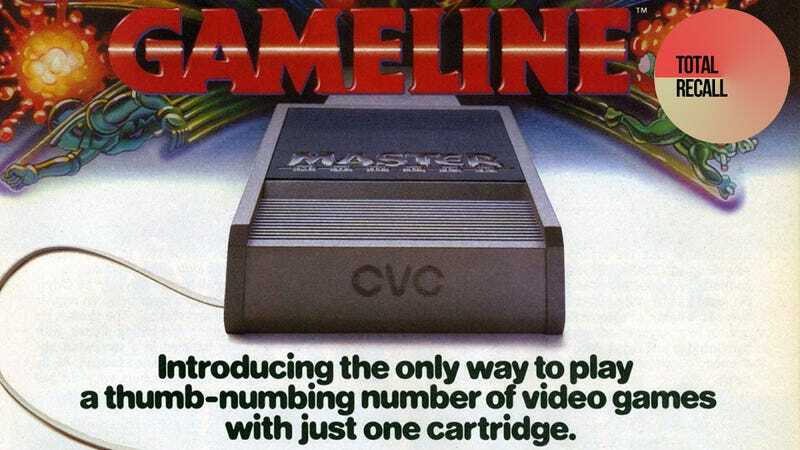 For $60 buyers would receive the necessary cartridge (which was both modem and storage device) as well as a year's subscription to the GameLine "service", without which they wouldn't be able to download a thing. Think of it as a proto-Xbox Live. Gamers could choose from around 75 titles, and when it opened for business GameLine became only the second (after the failed Intellivision PlayCable) downloadable console game service in the world. Yet even at the very beginning, and despite a promising marketing campaign in the gaming press of the time, things started to go wrong for GameLine. On top of the subscription fee, it cost $1 to download a game for play. Sounds cheap, but this was a timed offer, and after around a week the game would "expire". If you wanted to play it again, you'd need to pay another $1. That made it costly when you added up all the games and playtime together on top of the subscription cost. A bigger problem, though, were the games on offer. While there were a few licensed titles to choose from, none of the big publishers of the day - we're talking Atari, Mattel, Coleco, and Activision - ever signed up for the service, robbing it of most of the biggest and best games on the console. When the video game market in North America crashed between 1982-84, it took GameLine with it, the high costs and low returns making the business as it stood untenable. By 1984 it was no more, gone like so many other gaming companies of the day. What's perhaps most interesting about GameLine, aside from its pioneering achievement as a downloadable console games service, was what came after. Many of the founders and backers of Control Video Corporation, the GameLine's creator, immediately dusted themselves off and formed a new company, called Quantum Computer Services, which provided online gaming services to Commodore computers like the C64. In 1991, Quantum Computer Services changed its name. To America Online. Or, as you more commonly know it as, AOL. FUN FACT: Intellivision's PlayCable may have been the first downloadable games service in the world, but the fact its games were limited to 4k and you had to rent the hardware from a cable TV provider meant it was a total bust.